As the launch of the Mac App Store grows ever nearer (mere days if interweb rumours are to be believed) developers are hastily uploading theirMac apps to be there at launch time. For the most part, Apple have streamlined the upload procedure and integrated it into the Xcode IDE well (although, you MUST remember to download and install an Xcode plugin from the developer site, or the facility is mysteriously absent). However the upload-to-iTunes-Connect procedure doesn't always work. In particular, it fails spectacularly (see the image) if your application name includes spaces. You tried to upload a binary whose bundle name contains a space. 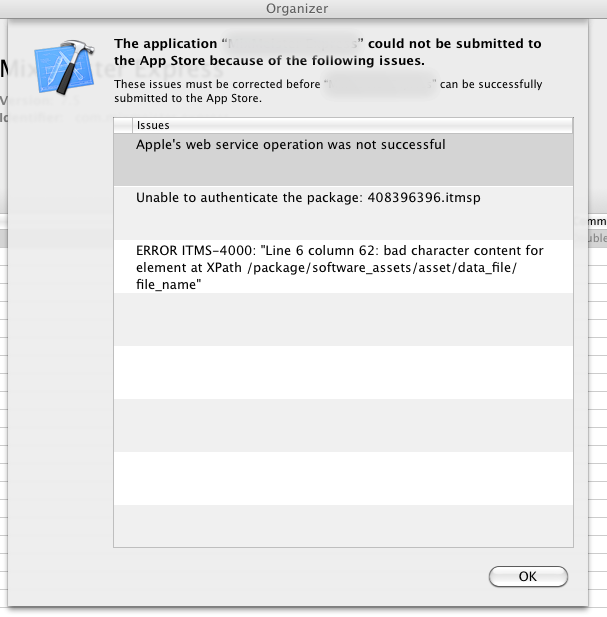 Apple's web service operation was not successful. ERROR ITMS-4000: "Line 6 column 62: bad character content for element at XPath /package/software_assets/assets/data_file/file_name"
Catchy, eh? User friendly, eh? It's particularly galling as the "Validate..." step in the Xcode organiser window will not check for this problem, and tells you that your application is valid for upload. Sigh. 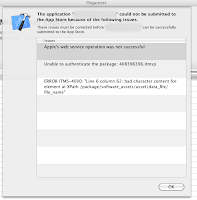 Rename the application without spaces. FAIL: No one wants to use an application called AddressBook. Fiddle the NSBundleName Info.plist entry so that it doesn't have a space in it, but leave the the "Application Name.app" filename as it was. FAIL 1: I don't think that this is a valid bundle any more. FAIL 2: It doesn't work. You still get the upload error. Scream, cry, whinge. FAIL: Whilst it doesn't actually make any technical difference, this will make you feel better for a short while. There is a solution, though. And it turns out to be quite simple. Rather than following the Apple instructions for uploading your app to iTunes Connect, perform the "Build and Archive" step. "Validate..." your application for luck. Then click on "Share..." and chose to save an image to your hard disk. Now use Application Loader to upload the pkg image created to iTunes Connect. Thanks for this. For what it's worth, it continued to fail for me until I removed the space from the .pkg file that I saved on my hard drive. You, my friend, are a savior! Now everything should work with Upload from inside the XCode Organizer. That saved me hours of work.